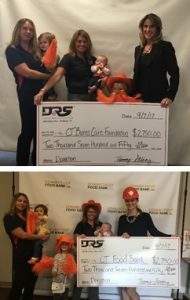 (MIDDLETOWN, Conn. Sept. 20, 2017) – Disaster Restoration Services (DRS), a member company of DKI, North America’s largest disaster restoration contracting organization, announced that they successfully raised $5,500 for the Connecticut Food Bank and Connecticut Burns Care Foundation through hosting their first annual charity golf tournament. The 18-hole tournament was held on August 17, 2017 at Lyman Orchards Golf Club in Middletown, Conn. Golfers competed in a scramble-format with prizes awarded for putting, longest drive, hole-in-one, and first and last places. All proceeds went to each charity. The checks were presented at the Connecticut Food Bank on September 7, 2017. Tammy Strong, vice president of DRS, was joined by Mia Freedenfeld of the Food Bank and Kathleen Gerrity of the Connecticut Burns Care Foundation to each receive $2,750 to help support their charity work. Disaster Restoration Services (DRS) can take any disaster clean up from start to finish. DRS is available 24/7 and services all of Connecticut. DRS provides services for: Water Mitigation, Fire Damage Clean Up, Storm Damage Clean Up and Mold Remediation. Not only can DRS do the mitigation, but DRS can also handle the remodel. Doing Restoration Strong! For more information, visit www.drscleanup.com or www.facebook.com/drscleanupllc. The mission of the Connecticut Burns Care Foundation (CBCF) is to promote burn prevention and help burn survivors lead productive and successful lives through the Children’s Burn Camp. The CBCF operates the Children’s Burn Camp for children ages 8 through 18, to promote self-discovery, build self-esteem and help children achieve a successful future despite challenges caused by their burn injuries. For more information, visit www.ctburnsfoundation.org. Founded in 1982 in New Haven, the Connecticut Food Bank is an affiliate of Feeding America. It partners with food retailers, growers, donors and volunteers to source food and distribute it through a network of community-based programs, including food pantries, soup kitchens, and emergency shelters that serve adults and children, as well through its Mobile Pantry, GROW Truck and Kids’ BackPack programs. To learn more, visit www.ctfoodbank.org.